The rise of 4K and 8K videos throws down a challenge to the current video compression standard H.264 since it no longer manages to encode Ultra HD videos at a satisfactory bit rate than the HD content. Contrarily, the next-gen H.265/HEVC video compression standard gains upper hand over H.264, thanks to its better compression efficiency. H.265 (HEVC) allows 50% reduction of bit rate yet delivers the same video quality as H.264 AVC. So to speak, H.265 is becoming the most commonly used formats for video compressing, distributing and recording 4K/8K UHD contents, let alone the HD/SD videos. Yet what is H.265? How much do you know about this H264 successor? Any further difference between H265 and H264? This post will throw light on the differences between the two standards H.265 and H.264, based on file size, bandwidth usage, bit rate, quality and compatibility. H.265 is also called High Efficiency Video Coding (HEVC). As its name suggests, H.265 is twice high efficiency than H.264 when encoding video. Namely, it halves the bit rate at the same level of video quality compared with its predecessor. It is targeted at next-generation HDTV displays and content capture systems which feature progressive scanned frame rates and display resolutions, as well as improved picture quality in terms of noise level, color spaces, and dynamic range. H.264 or MPEG-4 AVC is a video coding format that is currently one of the most commonly used formats for video content compression and delivery. 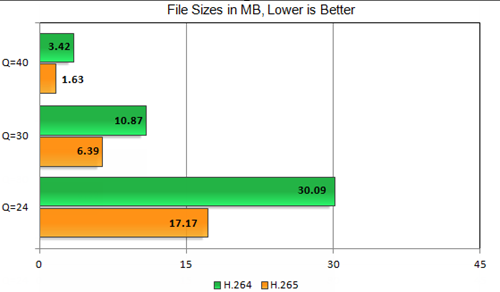 H.264 reported bit rate savings of 50% or more compared with its predecessor MPEG-2 Part 2. It has a a wide range of applications, covering all compressed video ranging from low bit-rate streaming applications (YouTube, iTunes, Vimeo, Facebook, Instagram) to various HDTV broadcasts over terrestrial, cable, and satellite. It is also commonly used for Blu-ray Discs, DVD storage, IP packet network, and digital cinema applications with nearly lossless coding. Convert H265 to H264 to Play without X265 Codec Pack? You need MacX Video Converter Pro - losslessly convert HEVC H265 video to H264 formatted by MP4, MKV, MOV, AVCHD, WebM, etc. 180+ video formats. Also compress H265 4K to H264 1080p/720p for faster uploading to YouTube/FB/Ins! With 410+ preset profiles, it converts HEVC video to any iPhone iPad Android, Nokia, PS4, Xbox One, Microsoft, Google Pixel 2, Amazon Kindle Fire for playback. According to wiki and official test, what differs H.265 from H.264 is the compression efficiency. 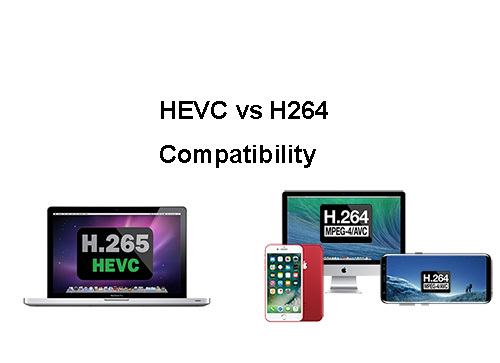 H.265 (aka HEVC) doubles the coding efficiency compared with its predecessor H.264. This means H.265 video saves around 50% of the bit rate at the same quality of coding. Specifically, the average bit reduction for H.265 is 64% at 4K UHD, 62% at 1080p, 56% at 720p and 52% at 480p. So if you download HEVC H265 movies instead of H264 movie, you can play HEVC on iPhone Android device with 50% storage saved. And the movie quality won't be affected at all. H.265 is superior to H.264 regarding to the bandwidth usage. Because H.265's algorithm uses the efficient coding, H.265 promises approximately 40-50% of reduction in transmission bandwidth needed to compress the video (e.g. in 720p) over H.264 at the same video quality. Generally, it requires 32 mbps bandwidth to stream 4K H264 video while it only consumes 15 mbps to broadcast 4K HEVC video. So you can enjoy 4k video smoothly even at congested network connection. >> Check the free X265 vs X264 review. The big difference between H.265 and H.264 lies in the video quality at the same bit rate. In H.264, the border areas of the block are likely to be distorted, because each macroblock is fixed and the data is independent to each other. While H.265 offers sharper detailed on faces and fabrics and smooth gradient areas with less blocking and fewer artifacts, since the new standard determines the size of code unit based on regional information. So H.265 is better than H.264 when it comes to compress a video with better image quality. The great compression ratio also has a great relationship with the digital storage requirement of video streams and transmission. The reduced bandwidth leads to smaller file size. Test shows a video encoded with H.264 is 1-3X larger than H.265. This is favorable for hard drive storage or the device with limited storage space required to house the video data.So H.265 advantages over H.264 in this regard. 1. Hardware configuration requirements: (CPU, GPU & RAM) Intel 'Skylake' Core processors/AMD 'Carizzo' APUs or newer; AMD 'Fiji' GPUs/Nvidia GM206 GPUs or newer (partly). Visit techspot HEVC video guide to see the whole list. 2. Software: download HEVC x265 codec pack to your VLC or other limited HEVC players like 5KPlayer, Potplayer, etc. 3. Operating System: Windows 10/macOS High Sierra/iOS 11 natively support HEVC video decoding and playback. H.265 vs H.264, which one is more suitable for you for videos playback? Of course, H.264 codec is applicable for almost all common devices. But things are not feasible to H.265. For devices that can decode HEVC video, performance is a concern. Here we tested the performance of various devices on average CPU usage, median clock speed and battery life for a reference of final decision of H.265 and H.264. H.265 has many advantages over H.264, e.g. It supports up to 8K UHDTV (8192×4320 maximum), 4:4:4 and 4:2:2 chroma sub-sampling, supports up to 300 fps (earlier versions only supported up to 59.94 fps), data rates of several GB/s, and file size 'subjectively' half the size of H.264 with better quality! The H.265 has potential impact on accellerating 4k screens demand and sale, offering higher quality video even in bandwidth constrained network, etc. There is aslo a downside in H.265 that H.264 is no problem at all. The former takes longer to encode a video when compared to H.264. So if you go a H.265 encoder, you may experience longer encoding time. Secondly, Since H.265 is a codec of the future, not wildly used now, watching H.265 videos is not as simple as it seems. H.265 is so far acceptable by iPhone 6 or letter, Windows 10, Roku 4, Amazon Fire TV, Xbox One. There are still a large number of protects that cannot recognize the media library encoded with H.265. So converting H.265 to H.264 is still highly demanded nowadays. To make HEVC/H.265 viewable possible, a professional H.265 video converter such as MacX Video Converter Pro (or Windows version) meets your increasing needs to convert and encode H.265 to H.264, MPEG4, MP4, MOV, AVI, MKV, WMV, etc for limitlessly playback on iPhone, iPad Android, Apple TV, UHD TV, Game Consoles, etc. With 320+ video codecs and 50+ audio codecs built-in, this video converter is an excellent H.264/H.265 video converter, encoder and decoder thatcan easily convert H.264 to H.265, H.265 to H.264, MKV to H.264, AVI to MP4 etc. and transfer H.264 encoded videos to 410+ latest mobiles, including iPhone X/8/7/6S/SE/6 Plus, iPad Air 2/Mini 4/Pro, Samsung Galaxy Note 8/S8, Sony Xperia Z5, Surface Pro 4, PS4, etc 5X faster than others, thanks to the unique support of Intel QSV hardware encoding technology. Step 1. Click "Add Files" to import the video. Batch convert is supported also. Step 2. 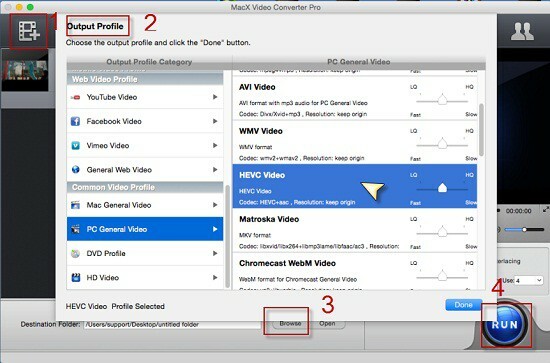 Choose H.265 codec for the PC General Video profile. Plus, you can also convert H.265 to H.264 and find some general video formats coded with H.264 such as MP4, MOV, M4V etc. Step 4. Press "Run" to start to convert H265 video to H264 and close the application whenever the conversion finishes.